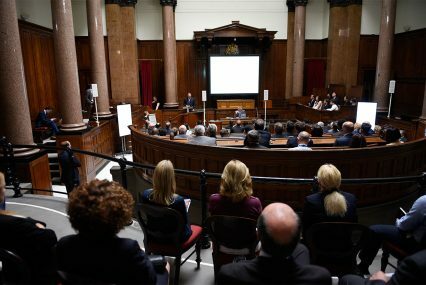 The courtroom in St. George’s Hall in Liverpool provided an ideal location for a debate on the upcoming EU referendum at the GTR UK Trade and Export Finance conference. Two representatives argued the case for each side. Rollo Reid, technical director at ReidSteel, and John Elliott, Ebac’s founder and chairman, argued for the Leave side, while the Remain side was represented by Rebecca Driver, director at Analytically Driven, and Tony Attard, founder and CEO at Panaz Group. In this video, they each summarise their points to one argument voters in the trade finance community should keep in mind. In Liverpool, the jury and the audience voted overwhelmingly for the Remain side, and presiding judge Michael Dougan, professor of European Law and Jean Monnet chair in EU Law at the University of Liverpool, agreed they presented the more legally sound arguments. “The Remain side offered a much more accurate, compelling, evidence-based description of the way the EU operates,” he tells GTR.